Jan Gordon's book, "The Ostwald Colour System, An Elementary Introduction" (1938, Reeves & Sons) is very rarely seen. 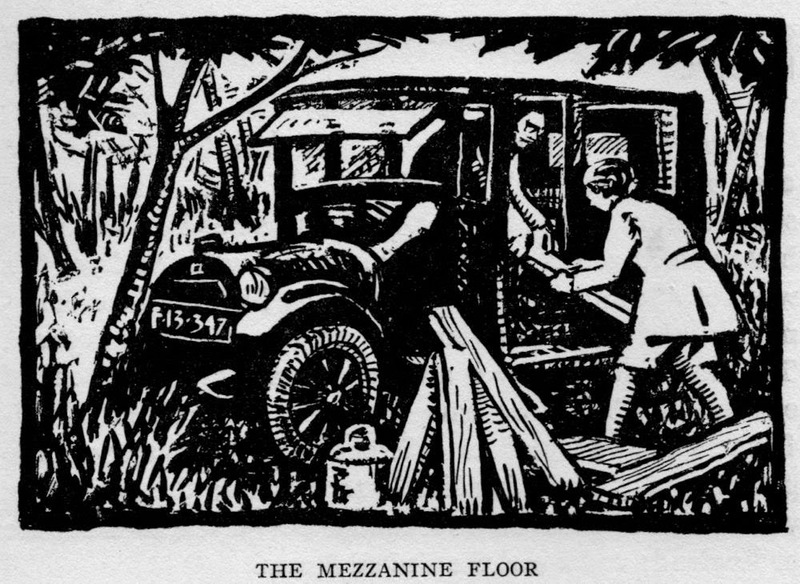 This work was the only one missing from the list of Jan Gordon's books produced for his memorial exhibition in 1944. Gordon begins with, "To understand sufficiently how the Ostwald Colour system was constructed and to understand how it may be used is not, I believe, as difficult as many would have us think." 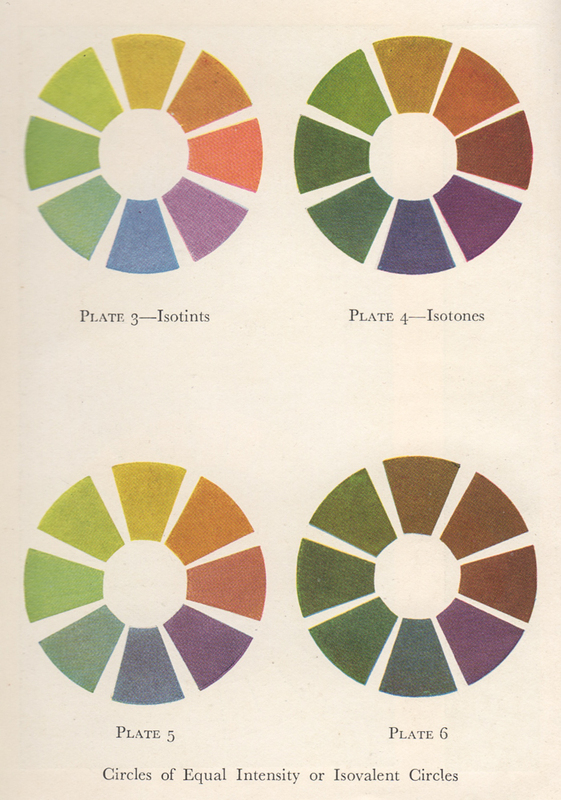 He recommends the system to artists, "making them more keenly aware of the properties of colours in harmonious associations" and also for use in schools, "by helping pupils to realise what a colour is, what it can do and how it may be combined with other colours." 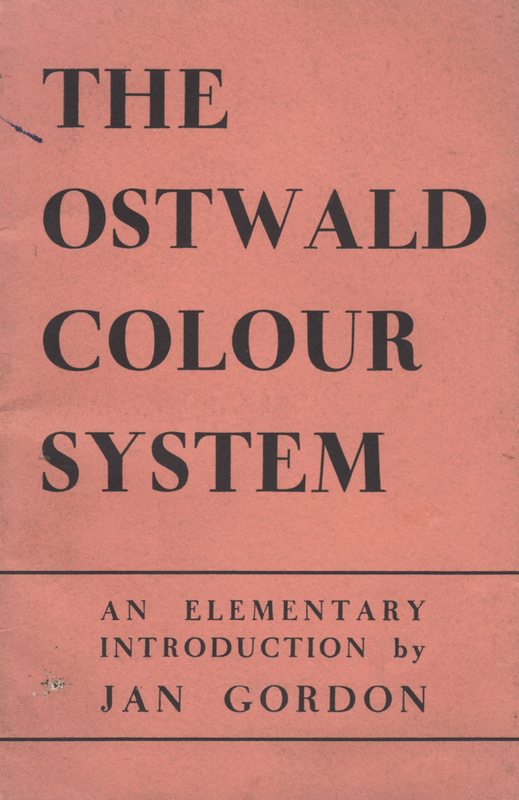 "The Ostwald system creates a colour space based on dominant wavelength, purity, and luminance, mapping the values of hue, saturation and brightness. 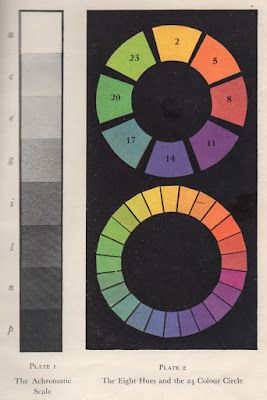 Establishing the values for these parameters is done with a disc colorimeter which mixes on a disk amounts of the pure spectral colour at the dominant wavelength with white and black." 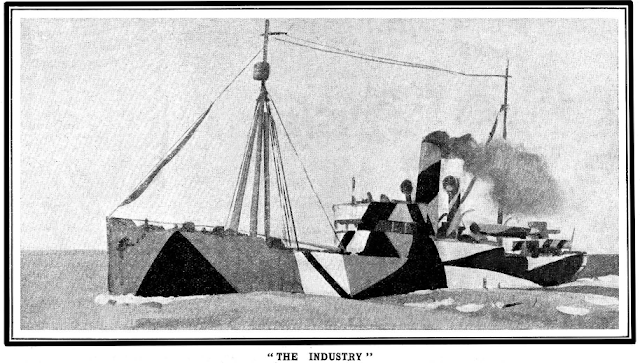 Gordon explains Ostwald's subdivision of the greyscale and colour circle using "the threshold of sensation," being the thresholds at which a trained eye can perceive changes. He is interested in questions of harmony; "The question of whether there actually can be a logical science of colour harmony, such as that established for musical sounds, has long been a vexed one." While noting the many difficulties, he argues that "the discoveries of Dr. Ostwald do bring quite a definite measure of preliminary order" and suggests experiments in colour harmony, making use of circles of equal intensity, tint and tone. To facilitate such experiments, the back of the book presents an extensive catalogue of "Materials for the Ostwald Theory" offered by Reeves and Sons.